Splash and Burn is an awareness campaign responding creatively to unregulated farming practices of palm oil in Indonesia. 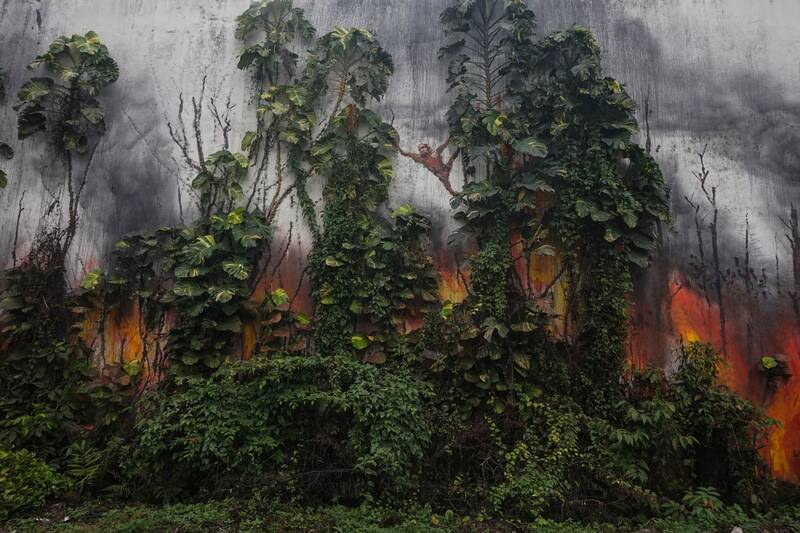 Tackling issues such as the transboundary haze, deforestation, human and animal displacement; murals/sculptures and interventions have been appearing throughout cities and the vast natural landscape of Sumatra. The campaign is collaborating with a number of local and international NGOs including SOS and our Indonesian sister organisation, OIC. The project is initiated by Lithuanian artist Ernest Zacharevic, who throughout the last two years has been actively researching the issue, visiting and scouting locations and connecting with experts and specialists in the field. The project was funded by the release of ‘Splash and Burn’, a limited edition print which was sold, generating the full independent funding. Since February, artists have been generously donating their time and creativity to the cause, arriving in secret to execute works. Conflict palm oil is a longstanding controversial issue that receives much media attention in peak moments of crisis, but very little in the months between the burning seasons. With global consumption increasing beyond the need to conserve our impact on our environment and communities, Ernest aims to introduce a new perspective to the conversation on palm oil. Using art as a tool, he suggests bridging the gap between the corruption surrounding the industry and the wider consciousness of the global consumer. Through a number of unique art projects Splash and Burn offers a creative platform for organisations and NGOs fighting for positive change.